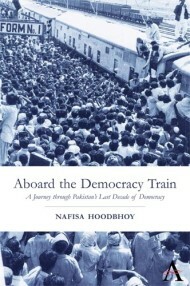 The updated edition of Aboard the Democracy Train, Pakistan Tracks the Threat Within has sold hundreds of copies across Pakistan, with most of the sales having taken place in Karachi. Published by Paramount Books, Karachi in 2016 in hard cover, the final edition brings the reader up to speed on the title originally published by Anthem Books, London in 2011. The capture of Osama Bin Laden represented a turning point in US and Pakistan relations. Consequently, the author updated the book from her vantage point in Washington DC and had the final edition published in Pakistan. In 2016, she launched the updated edition in Peshawar and Quetta – with the Peshawar University and Quetta Press Club events mostly focused on the attack on Army Public School and the Baloch insurgency. Since then, the book has been purchased by schools, public libraries, military and business institutes, NGO centers and sold at book fairs and leading book stalls across the country. The books have sold in Skardu, Bannu, Jhelum, Faisalabad, Lahore, Peshawar, Kohat, Quetta, Rawalpindi, Islamabad, Khairpur, Sukkur, Larkana, Hyderabad and Karachi. They may be ordered online from the Liberty Book store (libertybooks.com), at the Paramount Books website (paramountbooks.com.pk) or from daraz.com.pk with cash to be paid on delivery.